You want to build the most functional space for the least amount of money in the shortest time possible. Value engineering will enable you to meet your construction goals through reduced short-term and long-term costs, efficient labor scheduling, and improved project design. The goal of value engineering is simple: to maximize project functionality while minimizing cost. Our architects, engineers, and contractors work together to design and build the structure that presents the most long-term value to our partners. When architects, engineers, and contractors work together from the start, the best materials for both aesthetics and functionality are selected from the beginning of your project, ensuring optimization of cost and preventing changes that cause builds to run behind. Careful management of the process from start to finish maximizes labor productivity through reduced downtime, optimized scheduling, and efficient processes. 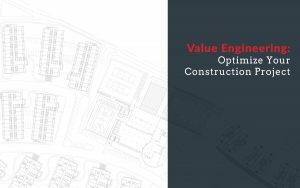 The goal of value engineering is to maximize your project’s lifetime value, and requires a long-term view. Our team often recommends an up-front investment to realize savings over time. We prefer to use long-wearing materials, high quality mechanical systems, and energy efficient lighting systems. A critical component of creating a highly functional space is understanding the developer’s definition of value. We work with each of our partners to understand the project’s goals, and then perform a functionality analysis. This involves identifying each of the elements of the construction project, evaluating their functionality, and considering alternatives until the optimal solution is reached. Through this process, our expertise is applied to build a structure designed to effectively serve its purpose. Our team brings over 30 years of design/build experience to each of our projects. Our time in the construction industry has provided us with the insight to understand what makes a space functional for each of our partners, and build that space in the most efficient, cost-effective manner. Value engineering will enable you to save time, money, and optimize your project’s design to meet your construction goals. Learn more about our construction services when you visit our website.